From the north: Take I-75 South to the Cumberland Boulevard exit, 258. Turn right on Cumberland Boulevard, then right on Cobb Galleria Parkway. Turn right at the Cobb Energy Centre sign. The parking deck is straight ahead, with the entrance on the left. From the south: Take I-75 North to the Cumberland Boulevard exit, 258. Stay in the middle turning lane. Turn left on Cumberland Boulevard. Turn right on Cobb Galleria Parkway. Turn right at the Cobb Energy Centre sign. The parking deck is straight ahead, with the entrance on the left. There are 1,000 on-site parking spaces; 700 in a four-level deck and 300 more in a surface lot. Valet parking is available for select performances. An additional 600 spaces are available at the Galleria office park across Akers Mill Road. Self-parking is $10.00; valet parking is $15.00. Cobb Community Transit, Route 50 Outbound, Route 50 Inbound. The bus stop is at the corner of Akers Mill Road and Cobb Galleria Parkway. MARTA, Route 12 schedule. This bus route runs from Midtown Station (N4) to the Cumberland Transfer Center. Please contact MARTA regarding specific bus stop locations on this route. Enjoy elegant and convenient pre-opera dining at Mangia! on the Mezzanine level of the Centre before every Mainstage performance. Reservations are required at least five business days in advance. Cobb Energy Centre is ADA-compliant, with wheelchair-accessible elevators located in the parking deck and inside the lobby. Handicap accessible seating is available in the back of the Orchestra level; these tickets are not available online, and must be purchased over the phone through Patron Services. Please call 404-881-8885 for more information. Paris on Ponce is located at the intersection of Ponce De Leon Place and Ponce De Leon Avenue. The main entrance will be on your left as you turn from Ponce De Leon Avenue. You may also access Paris on Ponce from the BeltLine’s Eastside trail. We suggest parking in the paid parking deck at Ponce City Market and walking over to the venue via the BeltLine. Park in the deck and take the central elevator to the third level. Go left out of the elevator and continue on that path until you reach the BeltLine. Go left on the BeltLine and cross over Ponce de Leon Ave, and Paris on Ponce will be on your right immediately after the bridge. Follow The Atlanta Opera signs to the venue. Limited handicap parking spaces will be available at Paris on Ponce on Ponce de Leon Place (parking lot is located between Paris on Ponce and Morningstar Storage). Overflow parking is on Maiden Ln NE or St. Charles Ave NE. Please lock your car and remove all valuables. 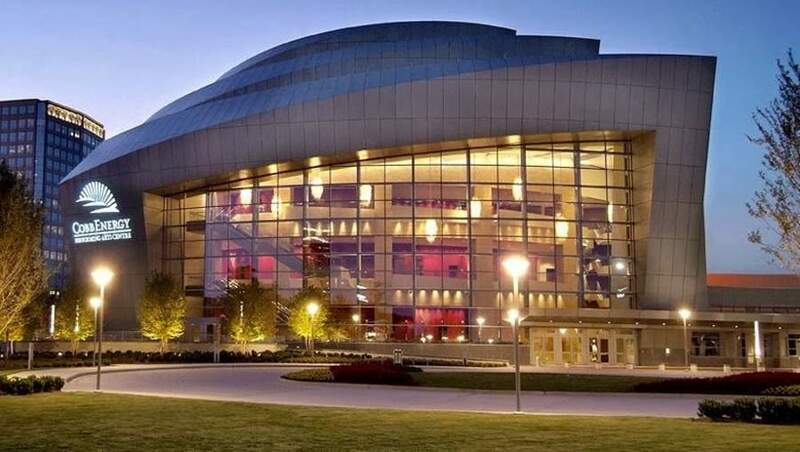 The Atlanta Opera does not take responsibility for any lost, stolen, or damaged items. The North Avenue MARTA station is a mile and a half away. Once you get off at North Avenue, take MARTA Bus 2 – Ponce de Leon Ave and MARTA Bus 102 – Moreland/Candler Park to Ponce City Market. From there, you can walk a short distance East up Ponce de Leon Ave until you arrive at Paris on Ponce at the corner of Ponce de Leon Ave and Ponce de Leon Place. The BeltLine also connects between Ponce City Market and Paris on Ponce via the Eastside trail. Ramps are available for easy access into the building, as well as inside Le Maison Rouge. Valet parking will be provided. City Springs is located on the west side of Roswell Road between Johnson Ferry Road (north) and Mount Vernon Highway (south). From I-285 eastbound – Take Exit 25 (Roswell Road) and turn left. From I-285 westbound – Take Exit 25 (Roswell Road) and turn right. Ample parking is available with approximately 1,125 parking spaces on site, with 750 of those in an underground parking garage. From Roswell Road, turn west onto Mount Vernon Highway and take an immediate right on to Galambos Way. The east parking garage entrance/exit will be on your right. There is an alternative entrance/exit on the west side of the garage located under the southern Aston apartment building on Galambos Way. Parking in the garage is free for the first 2 hours. Parking in any of the surface street spaces are metered at a rate of $1/30 min, $2/1 hour, $4/90 mins. For special events, garage parking is $5 and valet parking is $15 unless otherwise noted. From MARTA Sandy Springs station – Bus route 87 stops at City Springs. From MARTA Dunwoody station – Bus routes 5 and 87 stop at City Springs. Please visit the City Springs’ website for dining recommendations.